Shelf life and food safety is a major requirement in the salads, vegetables and fruit processing Fresh-cut industry. Now, KRONEN has further developed its UVC disinfection lock adapting it to the needs of the users. 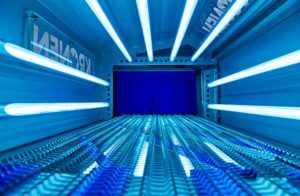 By means of Ultraviolet-C radiation technology, the surface of vegetable and fruit products as well as of packaging materials and tools passed through the lock is disinfected efficiently and without using heat or additives. A precondition for food safety and shelf life of Fresh-cut products is a maximal hygienic processing and packaging. 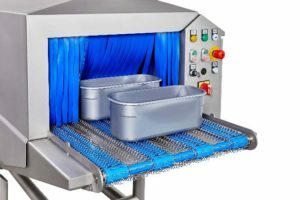 The UVC disinfection lock of KRONEN is suitable for both: The surface of processed fruit and vegetable products, but also of packaging materials such as crates, boxes, or even of tools used for the processing can be disinfected. The UVC disinfection technology is based on the production of UV radiation with a wavelength from 280 to 100 nanometers. Light of this wavelength is germicidal, since it destroys the germs’ DNA. By implementing so-called low-pressure tubes or more powerful hybrid tubes the UVC light is created in the completely sealed casing of the disinfection lock. The germ reduction is indicated by the measuring unit of “Log10“ steps. If you have, for example, a number of 107 germs per gram at the beginning and it will be reduced to 102 germs per gram by the means of disinfection; then, this is equivalent to a reduction by 5 Log10 steps. Depending on the number and type of tubes and depending on the speed, which the lock is passed through with, the KRONEN UVC Lock can remove more than 6 Log10 steps and thus, up to 99,9999 % percent of the germs (example based on Listeria monocytogenes germs). Thanks to the UVC treatment the products and boxes are disinfected efficiently, safely and reliably within very short times – and this is without using heat or any undesirable additives or residues. Input of unwanted microorganisms into sensitive production areas is reduced by the UVC disinfection. Shelf life of products is increased and value added is enhanced. Another benefit is that drying of containers – as it needed to be done after spray disinfection – is no longer necessary. And the UVC Lock is ideally suited for separation of two rooms, e.g. low and high care. It is also suitable for extreme application areas with wet cleaning and for all temperature ranges. 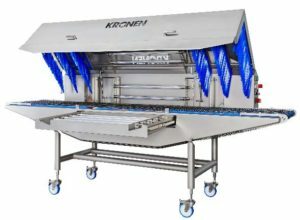 The KRONEN UVC Lock is equipped with the latest UVC technology of sterilAir® – it offers high throughput capacity and highly efficient disinfection. The UVC Lock offers high throughput capacity and is highly efficient in killing germs. As a standard, it is equipped with 12 or 20 ET 2236-4H tubes. Optionally the UVC Lock is available with a range from 6 to 26 tubes and high-performance hybrid tubes. Due to the efficient positioning of the UVC tubes an irradiation almost of the entire area is guaranteed. The UVC technology of sterilAir® features long lifetimes of the UVC tubes, exemplary low energy consumption, and low emitter temperature. Short contact times within the UVC Lock allow deployment with heat-sensitive products, too. The fully enclosing UVC Lock casing with hood cover is made of stainless steel and guarantees the safe use of UVC radiation. A switch panel allows easy operation, there is no display panel necessary, however, it is offered optionally. Just as the staff at the infeed belt, the staff at the outfeed side also has the option to stop the UVC Lock‘s conveyor belt. The according switch box can be installed flexibly at the wall in the high care. When stopping the belt it continuous running until the belt is completely cleared and free of products. All materials with a size from 50 x 20 x 50 mm to 550 x 300 mm (BxHxL) can be locked through gently. Optionally an adjustable speed control is available. A simple tube control is possible by using the inspection windows at the front and rear side of the UVC Lock. Optionally each single UVC tube can be monitored via switch box and data can be readout on a computer or mobile device. By this means, the tubes‘ replacement interval can be identified. Besides, further machine status data can be collected (e.g. runtime or speed). An perfectly designed interior and a base made of round tubes allows quick and easy cleaning and guarantees maximum hygiene. Optionally a base with castors is available as well. The UVC Lock is equipped with a hood cover and a safety locking device. The handholds are attached in an ergonomic distance. The FDA approved shatter protection meets highest demands and safety regulations. Contact Mosur Machine for more information.